Features: Dark, warm, and resonant. Assists in producing a full, centered tone. Although technologically superior, its sound is similar to the sound produced by the age-old string ligature. Made in the USA! 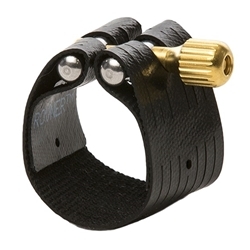 For decades it has also been the "go-to" ligature for music educators, knowing they can recommend it with complete confidence that a Rovner™ ligature is just the thing to help developing players move to the next level of performance.